As you may have seen on Twitter, Facebook and Instagram, we were callously abandoned last Monday and Tuesday as our mom traveled to New York for the Purina Better With Pets Summit. So, take it away, mom! Until then, let me give you a peek into what went on at the Summit. Some of the content is worthy of a few Monday Medical articles, and I promise you'll get exactly that next Monday. Today l'll give you the broad-brush overview. Purina brought in bloggers, veterinarians, researchers, and select members of the press to attend this day-long event. The day's topic examined ways we can improve the emotional wellness of pets. & Christina Ha, NYC Cat Café. Photo copyright ©2015 Nesté Purina. Used with permission. "Caring for pets in the best way humanly possible is both a duty and an honor." She went on to say that their intent today was to explore ways that we can benefit our pets' lives. Did you catch that? Usually the discussion is on how we can benefit from our pets lives, not how we can benefit their lives. The first discussion panel was on "Are Millenials Changing our Relationship with Cats?" I didn't realize it until afterward, but when the emcee introduced the panel, he summed up its essence really well when he mentioned how he had initially not known how to interact with his newly adopted senior dog. He said he found himself using recycled compliments he used to give old girlfriends to relate to his dog: "Your fur looks so nice today, Bizzy." "Is that a new collar? It really brings out your eyes!" So okay, he was a comedian and probably wasn't actually that bad at connecting with his new pup. But his joke's absurdity actually encapsulated one of the most important points the panel made: cats are not miniature humans. They are an entirely different species, and should be treated as such. "That's right, lady. As much as you like to anthropomorphize, I am NOT a miniature human." Photo of black kitten in Purina Cat Experience Room. And now I'm going to be nasty and make you wait for the Monday Medical post that details what the panel said about how cats should be treated. I'll also share their thoughts on the actions and attitudes we (yes, even cat people) hold onto that need to change. The second panel was equally interesting: "Stress, our Pets, and Us." It was moderated by Dr. Marty Becker. A behaviorist, an architect, and a DVM cat stress expert were the panelists. I was especially impressed with the stress expert, Dr. Tony Buffington. When asked what stress looks like in a cat, he reminded everyone that in many cases, what we're really doing is keeping cats like zoo animals. Think about our shelters, our veterinary clinics. We keep them in confinement in an environment that is not their natural habitat. This is a huge stresser. The panel shared three changes that have been proven to help: a different approach to kennel design, the importance of location, and redesigned exam tables. "Let's not talk about exams... okay, lady?" A more stress-free cage design turns the cage bars in its side. They're horizontal and not vertical. And the base is recessed a bit, allowing the cat to feel as if he were hiding, while a human can easily see in to monitor the cat. This allows the cat a greater feeling of safety than existing kennels. Another recommendation would be especially helpful to share with your vet: Moe cats from lower to upper cages. Dr. Buffington said it may be a hard sell - in fact, had he not seen it with his own eyes, he might not have believed how much of an impact this simple move could have on the stress level of a cat. In his case, it actually saved a cat's life. Small changes but measurable results. A new exam table has a non-skid top that is warm and impregnated with pheromones. Compare that to your vet's cold, stainless steel exam table! Pull-out stairs also allow animals to approach the table under their own power versus being lifted, if they so desire. And now, soft rubber floors that can be sterilized are available, which are a great improvement over a cold, slippery linoleum floor. Overall, it adds up to a reduced-stress experience. When the discussions drew to a close, the Experiential exhibits opened for the afternoon. Each of the 6 stations had its own focus, from nutrition to healthy environments to cognitive function. 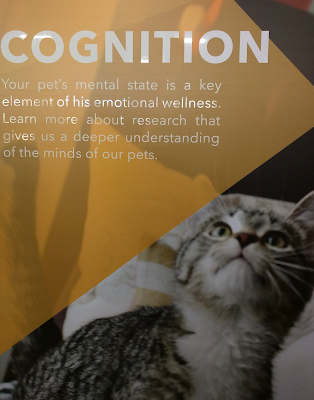 The Cognitition station had demonstrations of ways you could enrich your pet's life through mental stimulation. One of the concepts their research team shared was the benefits of puzzle feeders for cats. They had a prototype of a puzzle feeder that provided tactile stimulation for the cat while foraging for food. My favorite was the Cat Environment Room. Nope, that's not Ryker, the star of the anthology, Rescued. Ryker was the cat this blog was named for, and the One Who Came Before. Nope, not him. But he could sure play Ryker on TV. Literally, it turns out! 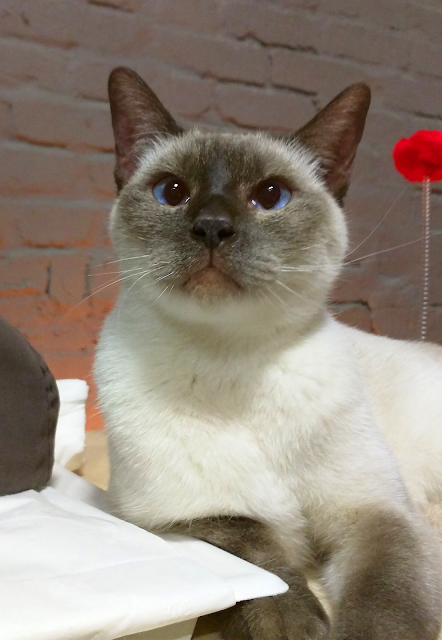 This guy is one of the many well-socialized cats owned by Cybercat Exotics that populated the room. They also frequent a lot of TV and movie sets. The Cat Environment was filled with feline stimuli: cat grasses, toys, and loads of vertical space for a cat to climb. And, of course, a ton of adoring fans. Nothing is breaking this little boy's focus! Not even hordes of admirers. "Okay, I deadded it. Now you can pet me." And it served to remind me: no matter how busy I am, I always - always - need to make time for my four-legged family members. As Nina Krueger admonished so wisely, caring for pets in the best way humanly possible is both a duty and an honor. It was a reminder I needed at a time when work is traveling at the speed of a supersonic jet. So we come to the real reason the Three allowed me to hijack their blog today: they've been getting an extra portion of playtime since I returned home. Thanks, Purina, I needed that. They needed that. .This post was sponsored by Nestlé Purina Pet Care. We are being compensated for writing this #BetterWithPets article, however regardless of the payment received, A Tonks Tail only shares content we feel our readers will benefit from. Our posts always reflect our honest and unbiased opinions. Nestlé Purina is not responsible for the content of this article. 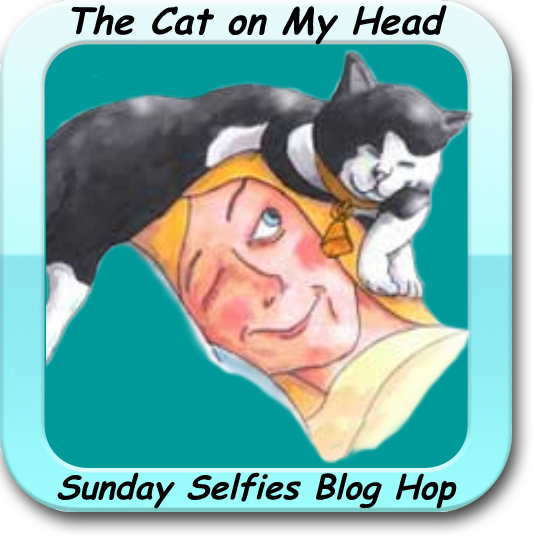 We're entering our doppelgänger in the Sunday Selfies blog hop, hosted by the kitties over at The Cat on my Head. Thanks for letting your peep share this, my peep AND I are looking forward to Mondays post. I hope Purina do something similar in UK. My human had so much fun seeing your human at the summit - and she had even MORE fun playing with all those kitties! I wanna know how they got their gigs - I want some of that action! I love what must have been one of the best experiences and yes, we need to NOT treat our cats as though they are miniature humans as certainly that is doing them a disservice and--- it's not good for them. Awesome post. The Summit sounds like a fantastic learning experience. I found the insights about cage design especially interesting. Cool - love the vet changes! That sounds like an interesting summit! Ask any dog and we can tell you, felines are a whole different species, very tough to figure out! It sounds like a great experience. I wonder if your already nice lives will improve? From everything we've read on all the blogs of those who went to the event, it was super well organized, very well attended, full of excellent and pertinent information AND some kitties to pet too! It sounds like a very interesting event. I look forward to hearing more from it. It sounds like a fun and informative event!! That sounds like a great conference and those kitties are too cute. Since your mom had to miss the World Series celebration, we're glad she learned that she needs to spend more time with all of you! LOVE the idea of softer substrate in vets offices that is able to be disinfected. I wish my vet would at least put a towel down for exams, but he doesn't, and I seem to always fail in remember to bring one..
You know, as I looked at it, I thought exactly the same thing. This would be great for species-appropriate and healthy treats such as Katnip Lounge's freeze dried chicken. 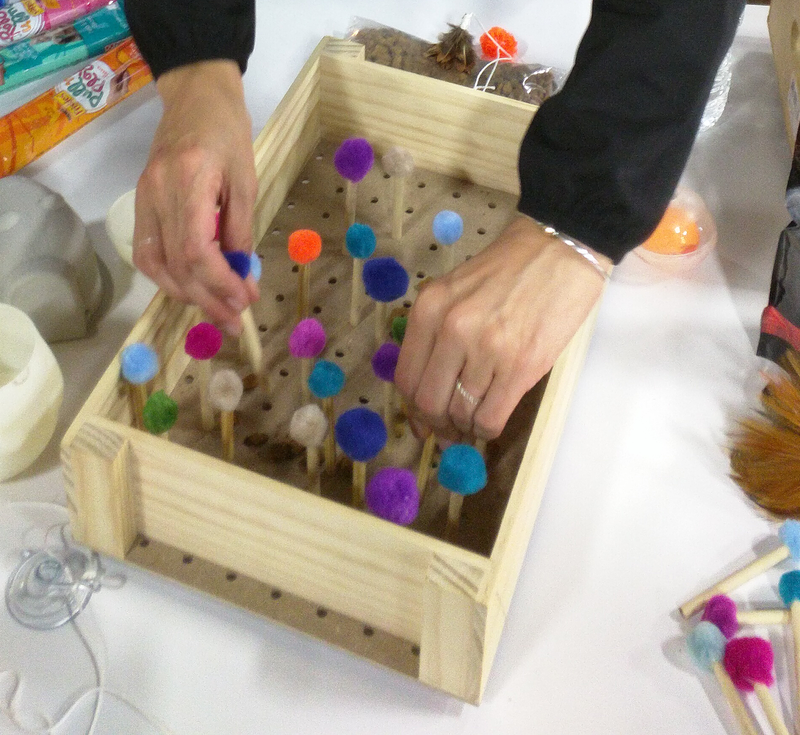 I absolutely LOVE the idea of engaging their minds through a puzzle feeder and would love it if someone would come up with a non-kibble-food version. It was so nice to see your human at the summit! What a great write up. What a great account from the summit. The head peep is super-duper envious that you got to be there and hear Dr. Buffington speak. She has a veterinarian-crush on all of the behavioral research he has done for cats. Mommy can't wait to read Monday's post, too! At our house Daddy is the real Whisperer...he's very much in tune with us and what we want.PLUS, he scoops! The Purina summit sounds like an amazing event and I sure hope to get to attend one day.Your final reminder is so, so true, and something we all need to remember. Thanks for sharing! Mommy loves hearing all about the Summit. And we hear all the humans squeeing about those kitties! Sounds like a lot of valuable information to help enhance animals' lives was shared at the summit. It must have been fun for your mom, and to see a Ryker look-alike probably brought back lots of wonderful memories. Sounds like a great summit!!! Can't wait to hear more! The Ryker look-alike was gorgeous! Thanks so much for taking the time to share!